Googling will find numerous explanations of what an ISO image file is. Essentially it is a single file that has within it all the contents of a CD or DVD. An ISO file has an ISO suffix (e.g. memtest86.ISO). When appropriate software is used, the contents of the ISO file will be unpacked and burned to a CD or DVD as a set of multiple files. 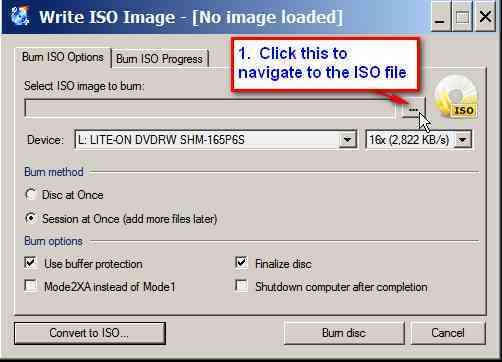 If you simply copy the ISO file to a CD or DVD that will be totally unproductive. What you need to do is to use an appropriate application to do the unpacking and burning to the CD or DVD. There are many commercial CD/DVD burning applications that will do that including Nero and Roxio amongst others. There are also a number of freeware applications and one of the best and easiest to use is CDburnerXP. Contrary to its name it works with all versions of Windows (from Windows 2000 to Windows 7), and burns CDs and DVDs. 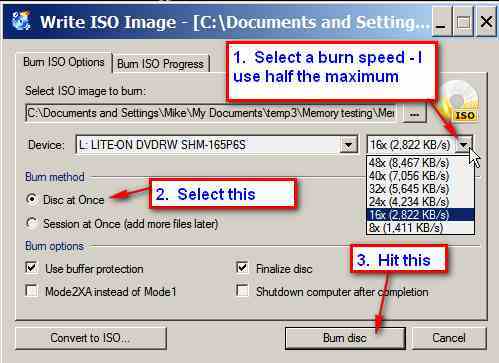 It can do a lot more than just burn ISO images, as you will see from the image shown below and is an excellent general purpose CD and DVD burning and copying application. In the following content I will briefly describe how to use that application to burn the contents of a CD or DVD from an ISO file. CDburnerXP can be downloaded from here: http://www.cdburnerxp.se/ After downloading, install it by double-clicking on the name of the file. Presumably you will have the ISO file as a downloaded file or one copied from a CD. Save or copy that ISO file to a location on your PC that you will be able to navigate to later. The CD or DVD may be either a blank write-once item. or a rewritable CD or DVD. If it is rewriteable and it already has something on it, then CDburnerXP will detect that and present you with the option of erasing the contents or canceling. If selected, it will undertake the erasing operation - you do not need to erase the contents before running CDburnerXP. 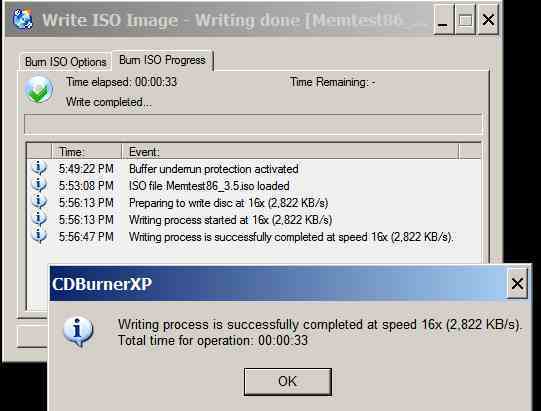 Then select a burn speed (I always burn at about half the maximum indicated burn speed), select "Disk at once" and start the burn. Once the CD or DVD has been burned, inspect its contents in Windows Explorer, and if you have created a bootable CD or DVD, try it out to see if it works. There are many alternatives to CDburnerXP. One excellent free application is ImgBurn. This is the successor to the discontinued freeware application DVDdecrypter and is from the same author. It is explained here: http://www.imgburn.com/ It can be downloaded from here: http://www.imgburn.com/index.php?act=download (download it from Mirror 8). It has features that may appeal even more to the advanced PC user. 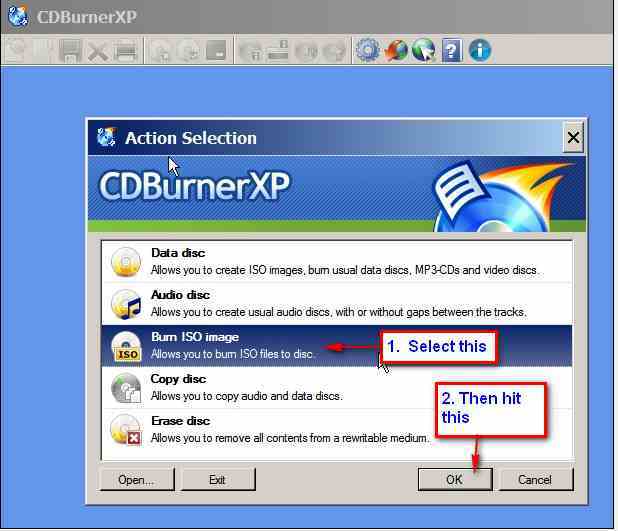 CDburnerXP is an excellent, easy to use application that can be used for burning CDs or DVDs from an ISO image. It can do a lot more than just burn ISO images and is an excellent general purpose CD and DVD burning and copying application.